STK Atlanta, an upscale restaurant and bar, features the STK brand’s signature cattle-horn artwork and celebrates it on a grand scale. 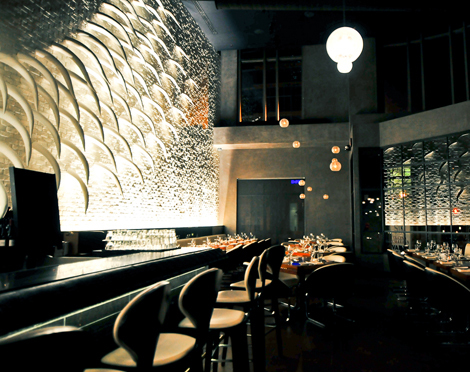 A DJ booth keeps the music pumping while patrons enjoy the spacious bar or dinner at the curvaceous custom booths. Like its sibling locations in New York City, LA, and Las Vegas, STK Atlanta is the reinterpretation of the traditional American steakhouse, infused with the flavor of a chic nightclub. Located on the ground floor of 1075 Peachtree at the corner of 12th & Peachtree in Midtown, the design takes its cues from the original Downtown NYC STK location. 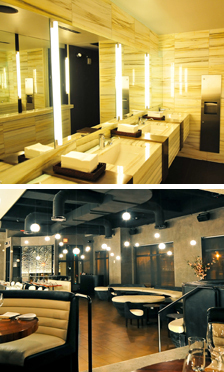 The interiors feature a mix of brick textured walls and curvilinear banquettes, all in contrasting colors of black and white. 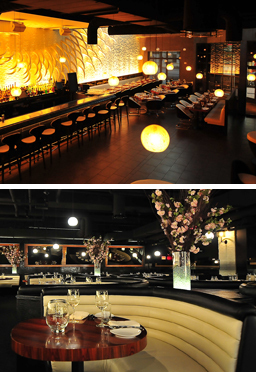 The main floor includes a raised main dining area, a lobby bar with DJ Booth, and a bistro lounge. Above the main floor is a mezzanine level with two private dining rooms that overlook the level below.